Going Bus-Based Presents a Multitude of Opportunities. 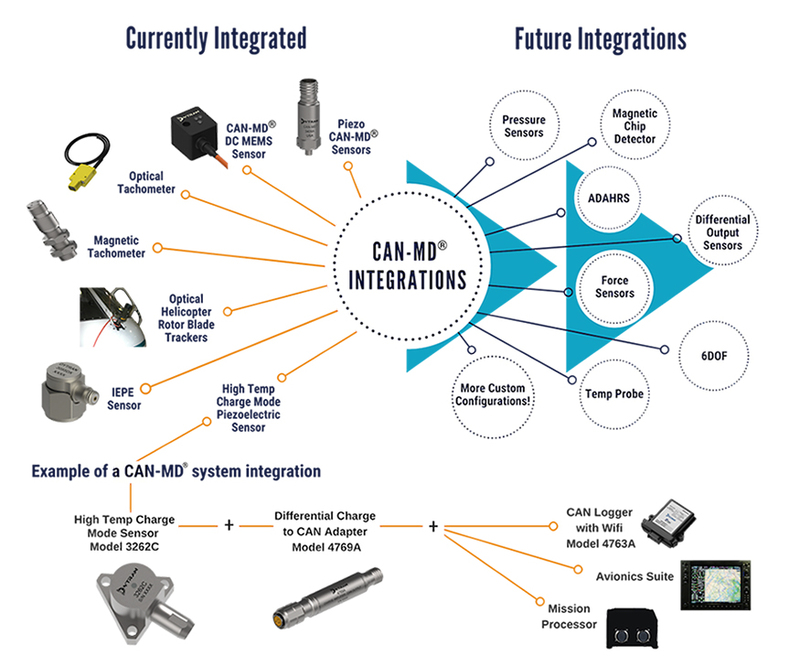 CAN-MD® can integrate the entire sensor suite. The CAN-MD® platform can support almost any type of analog sensor. So far we have adapted IEPE accelerometers, high temperature charge mode accelerometers, optical and magnetic tachometers to the bus using CAN-MD® adapters. The technical vision for the system is that it will support any type of sensor including pressure, temperature, chip detectors, etc. any sensor can be redesigned with an internal microprocessor to allow for direct bus interface or can be brought to the domain via a bus adapter designed to support that particular type of sensor. Those who desire a “turn-key” solution, pre-loaded with diagnostic software, ready to install and use. CAN-MD® is already configured with boot loaders to accept new software and to upgrade existing software! Developers will be provided with a published copy of the ICD and will be able to program the system on their own after a short training period with Sage Machinery Diagnostics, our development partners. Sage has 25+ years of machinery diagnostics experience to rely upon and will configure a digital solution to take your on-board diagnostic system into the future. For those who want to continue to develop their own diagnostic software, CAN-MD® offers a modern, bus-based platform that will open new possibilities for your monitoring solutions.